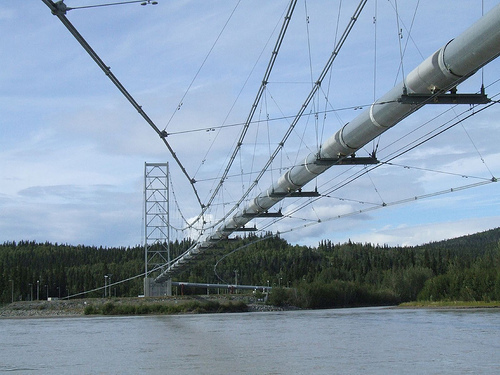 © Picture pipeline bridge in Alaska: Travis S.
"Capturing technology raises the energy consumption of a coal plant by an average of 32 percent." Earlier this month leading science and energy institutes advocated strongly for the development of carbon capture and storage technology. The science academies of the world’s 13 major economic powers called the implementation of carbon sequestration a “top priority”. Around the same time, the International Energy Association (IEA) argued for an energy technology revolution, of which carbon capture and storage forms a vital component. Meanwhile, many spin-offs and start-ups are presenting all kinds of "innovative" ideas that seem to differ substantially from the traditional approach of storing CO2 in underground reservoirs. The idea of carbon capture and storage (CCS) – first introduced in the 1970s - is attractive at first sight. To begin with, it is a natural occurrence. There are many natural reservoirs of CO2, which have kept this gas contained for many millions of years. Secondly, the potential for storage is significant. The available storage space in underground reservoirs (depleted oil and gas reserves, coal formations and especially saline formations) is probably large enough to store all the carbon dioxide still contained in earth's remaining fossil fuel reserves. It will take more research to find out which reservoirs are suited to this and which ones are not, but finding the actual storage space does not seem to be a fundamental obstacle. To add to this, the technology for capture, transport and storage of CO2 is available. Capturing CO2 from smokestacks has been a common practice for many years, for the purification of natural gas or at ammonia production facilities for instance. Injection and storage of carbon dioxide is already happening in the North Sea, in Algeria and in Texas. In these cases, CO2 is injected into oil and gas reservoirs in order to extract more fossil fuels than would otherwise be possible, a process called Enhanced Oil Recovery (EOR). For some of these applications, carbon dioxide is transported by pipeline or by ship. "If fuel use of electricity generation rises, the same goes for air pollution from coal plants and for the ecological consequences of coal mining. Storing the CO2 does not solve that." 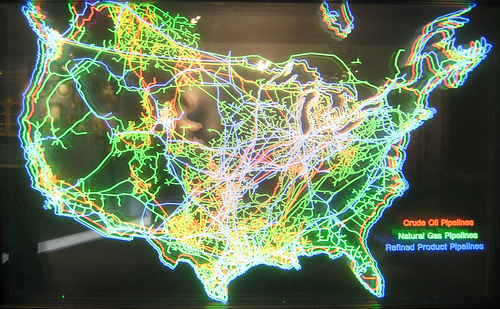 © Picture of pipeline infrastructure in the US : Ken Flannery. Carbon capture and storage requires a pipeline network that rivals the existing oil and gas infrastructure. Everything taken together, CCS will probably raise energy consumption by as much as 50 percent (this is an estimate as to my knowledge nobody seems to have investigated this yet). Even if all of the CO2 is eventually stored, a 50 percent increase in energy consumption is the last thing that the world needs. In addition, it is impossible to store all of the carbon dioxide. Capturing technology can only capture 80 to 90 percent of CO2 from smokestacks. Taking into account an additional energy use of 50 percent this comes down to a reduction in CO2 emissions of only 70 to 85 percent compared to a coal plant without carbon capture technology (and only if all emissions coming from the additional energy use are captured as well). "Carbon capture and storage requires a transport infrastructure that rivals the existing oil and gas pipeline network." There are losses during transport, too. According to the IPCC these are 1 to 2 percent per 1,000 kilometres of pipeline transport and 3 to 4 percent per 1,000 kilometres of ship transport (the ship's fuel use included). Carbon dioxide is also not the only harmful effect of power generation. Burning coal brings with it serious air pollution and produces waste, both of which will also rise by at least 30 percent. The same goes for the ecological damage of coal mining, which is devastating. Storing the CO2 can never prevent this. Because of all these disadvantages, researchers and entrepreneurs try to invent all kinds of other ways to keep carbon dioxide out of the atmosphere, like storing CO2 in consumer products, converting it to fuel or fixing it in rocks. Yet until now, all these proposals face – at best – a similar energy penalty. That is mostly because the first step of the process is always the same: capturing CO2 from the smokestacks of a coal plant will raise fuel consumption by about 30 percent. 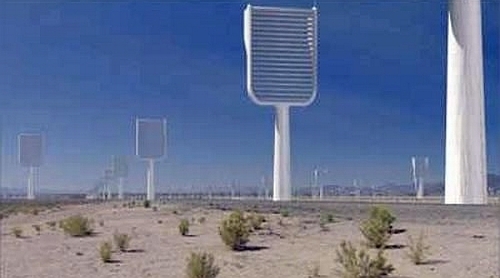 The only alternative to this capture technology – sucking carbon dioxide out of ambient air by means of "artificial trees"– consumes even more energy because the concentration of CO2 in ambient air is much lower than the concentration of CO2 in smokestacks. Artificial trees, a technology proposed by Klaus Lackner of Columbia University. Copyright Illustration Stonehaven CCS, Montreal (via). Besides, the storage potential of most of these alternative proposals is very limited compared to that of the traditional CCS-concept. A strategy that is getting a lot of attention these days is to store CO2 into consumer products based on polymers like plastic bottles or DVD’s, or in chemicals like those used in fertilizers, refrigeration or food packaging. The idea is that it is better to do “something useful” with captured CO2 instead of just storing it underground. However, even though the amount of chemicals and plastics we produce is enormous, as a carbon sink they are all but meaningless. "If all polycarbonates and polyurethane would be produced by means of CO2 this would only store the emissions of 3 coal power plants." What makes this approach even more useless is that these consumer products and chemicals have a relatively short lifespan, from a few months for fertilizers to a few decades for plastic products. When the fertilizers are used, or when the DVD’s end up in the incinerator, the CO2 goes back into the atmosphere. Using CO2 as a feeding stock for algae and then turning it into biofuel - another idea that is hyped these days - faces the same problem. It only delays CO2-emissions for a very short time. The carbon dioxide is converted into fuel which is subsequently burned in a car engine. The only alternative approach that really could store a significant amount of CO2 is mineral carbonation: fixing carbon dioxide in rocks (limestone). This method is also based on a natural process. Under the influence of weathering, the surface of rocks combines with carbon dioxide. Earth has no shortage of rocks, so the potential of this method is large enough to store all possible future CO2-emissions. But if we want the strategy to be useful for us, this natural chemical reaction has to be accelerated considerably and that is again a very energy-intensive process (rocks have to be crushed to powder in order to provide more rock surface, and then treated with chemicals and heated). According to the IPCC this method would raise energy consumption by 60 to 180 percent. Capturing carbon dioxide in rocks would also require a mining and transport infrastructure that is comparable (and which would supplement) today’s coal industry. To fix a tonne of CO2, you need 1.6 to 3.7 tonnes of rock. These rocks have to be mined and transported to coal plants (some industrial wastes and mining tailings can also be used, for example fuel ash from coal plants or de-inking ash from the paper industry, but their total amounts are way too small to substantially reduce CO2-emissions). The process also generates large amounts of waste materials (apart from the carbonised rocks themselves). For every tonne of carbon dioxide stored in rock, you are left with 2.6 to 4.7 tonnes of disposable materials. Carbon capture technology is expected to become more energy-efficient in the future. But that would hardly make the whole scheme more attractive. 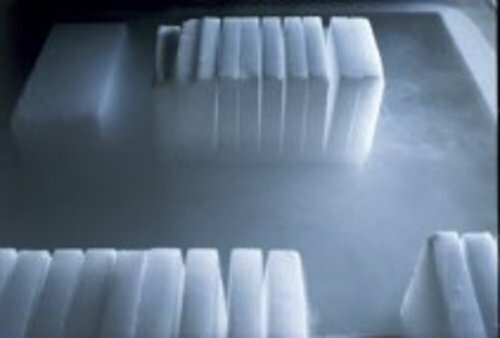 Storing carbon dioxide in underground reservoirs (the only realistic option) is risky, not unlike the storing of atomic waste. 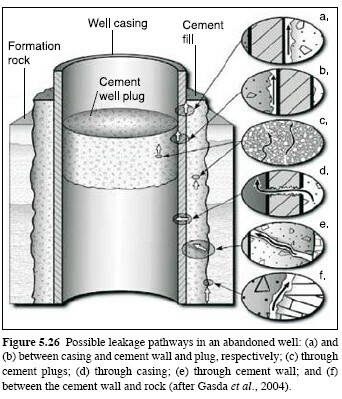 As can be seen in the drawing below, storing CO2 in essence resembles storing a gas in a stone pot. When an underground reservoir is filled up, all injection wells are closed by a cement "cork". This cork has to keep the gas inside for thousands of years. Now zoom out and you are looking at a planet with thousands of holes, each one sealed with a cork to keep inside a potentially deadly (and climate warming) gas. Reassuring, no? Yet, this is considered a high-tech solution. You also have a network of thousands of kilometres of pipelines, transporting the same gas and connecting power plants with these reservoirs. How big is the chance that leaks or sudden bursts will cause damage? According to the IPCC, the risk is low, at least if all pipelines and storage sites are monitored closely. Leaks will occur, they also occur through cracks in natural CO2-reservoirs (sometimes killing vegetation, animals and people), but if watched closely (by means of sensors and computers) they could be stopped in time. Earthquakes or accidental drilling operations in a former storage site could release large clouds of the gas in a short time, but that should be prevented by using carefully chosen locations and painstaking indexing of storage sites. All these risks might be manageable in the short term, but storing CO2 is – just like storing atomic waste – a very irresponsible thing to do in respect to future generations. Will people in 2178 still know where CO2 was stored? Will the corks hold until that date? Risk analysis does not seem to look too far ahead. Carbon capture will also bury a part of our oxygen supply, by the way. After all, we would not only store the C but also the O2. Oxygen is abundant in the atmosphere compared to carbon, so this might not be a big problem, but again, nobody seems to have investigated this yet. "Carbon capture will also bury a part of our oxygen supply. After all, we would not only store the C but also the O2." Carbon storage in the oceans was radically disapproved of by the IPCC because of the even larger risks, yet the idea returned last week and seems to be gaining support even with green thinkers. Why introduce yet another expensive, energy-intensive and risky technology if there are so many other and better ways to solve the energy crisis? If we choose to build a whole new infrastructure of pipelines comparable to that of the existing oil and gas industry, why not build something like an extensive underground tubular freight network instead? This would be a real solution, which would considerably lower transport energy use and CO2-emissions. Why not channel the huge amounts of money needed for the development of CCS to countries with tropical rainforests, so that they have a very good reason to protect them fiercely? Stopping deforestation, especially in tropical forests, would contribute more to the fight against global warming than carbon capture technology could ever do. Tropical forests store enormous amounts of carbon and they are not prone to natural forest fires. Why not put into force a regulation that prohibits the construction of any more power plants that burn non-renewable energy sources? There is already an enormous energy capacity in the world, why don’t we chose to do it with the energy plants that we have? This would at last make energy efficiency useful (because progress in energy efficiency is now always negated by new and more energy hungry products and services). Still want more energy? Build a solar plant or plant a windmill. These are just 3 ideas that would be effective without the need to adapt our lifestyle (which is, of course, also the attraction of "clean coal"). They would not solve everything, but at least they would be very welcome steps into the right direction, towards a solution. All high-tech carbon storage strategies described in this article are no solutions, they are just attempts to limit the problem. Let’s hope that the next appeal of the International Energy Association and of the Science Academies of the world (an awful lot of brains there) will contain a trace of innovative thinking. The world's factory hall : almost 30 percent of energy use and 35 percent of CO2-emissions in China comes from the production of export goods. Leave the algae alone : while the first generation of biofuels is wreaking havoc on the environment and the food markets, the second generation is set to make things even worse. The monster footprint of digital technology : how much energy do our gadgets really use? Why the electric car has no (wireless) future : the e-car has a conceptual problem. Nuclear reactors, but no fuel : already in 10 to 15 years time, there will be a severe shortage of uranium. Fixation of CO2 as rock does not require the rock to be "transported to coal plants", and the comminution energy is not large -- 5 percent, if memory serves -- as a fraction of the energy that was earlier gained putting the CO2 into the air by burning coal. More at RealClimate's "Air Capture"
Sorry, I'm having trouble following the logic of "the solution" here. You're saying, I believe, that the solution to the megatons of CO2 emanating from coal plants is to 1. regulate (read: control) the economies of tropical countries so they provide the biosphere that will naturally absorb the CO2 in the atmosphere 2. stop burning coal and 3.use more solar panels and windmills.? So 1.who would do this regulating of tropical countries, and do we really want to get into keeping a country impoverished to maintain our lifestyles? 2. Ban coal plants? I don't think so - the world's economy revolves around the power produced by those plants, and that concept will go nowhere 3. solar panels are also very energy intensive (to manufacture) and would have to cover the entire landscape to produce enough power to equal a typical coal-fired power plant. Windmills? They work where there is wind -- and steady wind at that, but they could never equal the power production that comes from firing. Surely this latter solution has been looked at by every coal-fired power plant operator who is faced with enormously rising costs in this new carbon economy. There are many reasons they have not been implemented -- high costs, unproven technology, intermittent supply, etc. The most prominent one is that coal is readily available, so it continues to be the source of more than 70% of the world's power. So, perhaps developing technology that removes the problem resulting from this usage is in fact the best current option. Is is perfect? Hardly,especially because it is early and somewhat wasteful technology, as you ably point out. But is it do-able? Yes. Unlike these other "solutions." No one solution is the cure. It will have to be a mixture of all of them: Sequestration where appropriate (i.e. close by); solar and wind where appropriate, and as supplements; other firing sources such as natural gas where appropriate. I think you misunderstood my point on tropical forests. At the moment, we can not expect tropical countries to protect their forests. For them, destroying these forests is a way to make money, even if it is just by burning them down and using the land for agriculture (or to grow biofuels or harvest the trees, which they can sell to us). They will only stop destroying these forests when it is financially interesting for them. Thus you should pay these countries an amount of money for every square mile of forest that is left intact. You should pay them *more* than what they could earn from it by selling the wood or cultivating the land. That money should go to the people who now earn their living by destroying the forests (from small farmers to greedy corporations), and to the government who must use it to pay guards who protect the woods (there will always be people looking for a double profit). These countries would get richer, because we would pay them enormous amounts of money (the money that we would otherwise spend on CCS). It will not be a cheap solution, but it will be very effective and without risks (again, a tropical forest can not burn down so there is no chance that the CO2 escapes). You got the second point: stop burning coal. Or at least, what I wrote, as a first step: stop building *new* coal plants. This is the one and only solution if you want to stop global warming. You may call this unrealistic, but that does not change the fact that it is the one and only solution. The solutions you give in the end, a little bit of this and a little bit of that, will not solve anything. That's business as usual. I am not campaigning for more solar plants and wind mills, because they don't even make a difference as long as we are building more coal plants at the same time. My proposal is to stop building new *power* plants. The next step could then be to change the ones we have by more clean sources, but this is of minor importance. The world could do fine with the power plants we already have. We won't be left in the dark. There would still be room for economic growth and for new products and services because in this case all innovative effort would go into energy efficiency. We would learn to do more with what we already have. It is a paradigm shift, but I don't see what's unrealistic about it. "If this energy were to be derived directly from fossil fuels the benefits of the CO2-savings by capture and storage will be offset by the very same energy intensive process"
This is not what happens. Think about it. You have a 1000MW (1GW) coal power plant, and you're using 350MW as 'parasitic load' to enable carbon capture and storage (these are roughly realistic figures). All that means is that you're producing 650MW of clean(er) electricity. That 350MW of 'parasitic load' only comes from your own power generation! It would be one crazy power plant operator who would say "no, let's not use the heat generated in our own process, let's pay for electric heaters!" 'Clean coal' is less efficient than dirty coal, that is true. But in this situation, efficiency is not important. What's important is the CO2 emissions per kWh of electricity, and the price of that electricity. If you were to put a price on carbon dioxide emissions, then clean coal becomes economical at about the same carbon price as onshore wind power. And since clean coal is for baseload power, and wind is for intermittent power, we actually need both. That's what the environmental idealists and the fossil fuel dinosaurs don't understand - that we're going to need a mix, because none of the technologies are sufficient on their own. I have read your comment several times, but I don't get your point. Your power plant produces less electricity than it would when the CO2 would not be captured. You get 650 MW instead of 1,000 MW, for the same amount of coal. You still have to mine and transport coal for a 1,000 MW electricity generation, and you only get 650 MW. Mining and transporting causes CO2-emissions too, and lots of other problems, but you leave that part out of your argument. Also, the figures you are criticizing, are not calculated by me. So what you are actually saying is that the IPCC has it wrong (not that this is impossible, of course). I enjoyed this, probably for the probably bad reason that it confirmed my own prejudices: you make excellent points that are very rarely made elsewhere. Bury that atmospheric carbon as charcoal in a marginally producing corn field and production jumps. In some cases production can jump as much as 400% in multi-year trials over controls because the biochar amended soils produced a crop and the controls did not. Biochar is a name for ground carbonized plant matter that is added to the active region of soils. It requires that the first crop planted be a legume or that some nitrogen is added to the initial application but after that the need for nitrogen rich soil amendments or fertilizers is reduced to get the same yields. Very large regions of the Amazon basin have man made Terra Preta soils that include large amounts of charcoal. These soils can support crop production year after year where normal tropical soils require rotational crops or large amounts of fertilizer. As pre-columbian Amazonians had no metal tools it's pretty obvious that people can use biochar techniques to grow crops no matter how poor they are. All they need is land and some scrub brush. "None of this is to suggest that the idea has no virtues, simply that they are outweighed by hazards, which the promoters have overlooked or obscured. Nor does this mean that charcoal can't be made on a small scale, from material that would otherwise go to waste. But the idea that biochar is a universal solution that can be safely deployed on a vast scale is as misguided as Mao Zedong's Great Leap Backwards. We clutch at straws (and other biomass) in our desperation to believe there is an easy way out." "Like many other postulated sustainable technologies, biochar too may fail the crucial "Scale Test" in the final feasibility analysis." Often using CO2 for enhance petroleum production techniques is often mentioned in articles concerning sequestration. Ignoring the fact that the well bores of the producing well have to open to the atmosphere. No matter good the producers are plugged and how well the casing to bore seal is inspected, there are going to be avenues of communication not seen or imagined. Ask Hutchinson KS who was rock by explosions caused be natural gas stored in old salt mines that leaked out traveling a distance, before it ignited. The one item that was and is ignored by the IPPC and our wonderful Government is pumping Co2 under ground constitutes a threat to existing and future generations . This can not be allowed to happen. 1,700 people lost their lives from a volcano that erupted Co2 and covered them in it, they died because there was nothing to breathe but death. But the elites have spoken and we will see many die because of their fruitless methods. 1,700 lost their lives in minutes so this can and will happen in congested areas if we allow this . The number one question is does Co2 cause warming , many scientist agree that it does not. I can provide a list but to what end would it be? It would die right here on this page . I think to do nothing would require courage but also believe it is the only way out. Soil is a large natural carbon sink; 2 to 3 times the size of the worlds vegetation. The carbon status of soil changes very slowly over time. The basic way it changes is crop residues add to soil carbon. The more crop there is the more carbon is added. To balance this soil carbon is oxidised and is lost to the atmosphere. The higher the concentration of soil carbon the more oxidisation. Other influences on the oxidisation are temperature, wetness, cultivation, fertilisation. There is significant soil carbon change with land use change and a smaller change with management practice. The issue is that it is hard to measure soil carbon accurately and land managers have little incentive to manage it. The benefit is that soils high in carbon are more resilient and have increased biodiversity. The worry is that climate change is predicted to have a negative impact on soil carbon. The solution should be to do the science to create improved and standardised soil carbon measurement systems and to move towards a solution for rewarding carbon capture and penalising carbon release. real simple idea why not save all the fall leaves grass clippings tree pruning all orqanic mater .prevent it from rotting in under ground storage no rot no co2. most communities collect this anyways so most of infrastructure is in place anyway.most places on the planet have underground holes manmade or natural. once filled with no air movement a small amount of decay creates a co2 blanket that well slow or prevent any further decay the way we are going this my be the bandaid that gets over this problem of warming its a grass roots idea. What about growing a bunch of trees and then make houses out of them before they rot. Homeless people could live in them so you solve that problem too. Just don't let them burn down. Make sure the houses have a lot of lawns to help in the c02 breakdown. Golf courses might be of some use as long as they were cut using electric power and not fossil fuels. We could quit bombing other country's or helping to bomb other country's. Use cement that makes nanotubes it's carbon negative and rebuild our infrastructure.